So ridiculously easy to make and virtually foolproof, I want to smack myself for not having done it sooner. The only real investment you need to make is patience in letting the dough slowly rise for 12-14 hours (I just did that overnight), and, perhaps, wrestling with an absurdly heavy iron cast dutch oven (never have I been more glad for my recent weight training initiative). The results are a beautiful crust, a moist, slightly dense crumb, and a wonderful tangy taste. 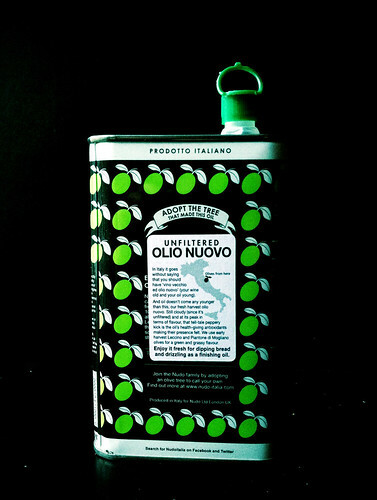 I also recently received freshly pressed olive oil from my adopted olive tree, and decided that ripped up pieces of my homemade bread dunked in olive oil from my olive tree was one of the most satisfying and hipsterish feelings in the world. Slightly adapted from Jovial Foods, based on the suggestions of Paul C.
Mix flour, salt and yeast together in a large mixing bowl. Add water and apple cider vinegar, and combine with your hands until all ingredients are mixed well. Your hands will be a sticky mess at this point, but that is normal with einkorn. With a spatula, push down the sides of the dough and flatten the top. Cover the bowl with plastic wrap and let rise in a dark place for 12-14 hours (you can also use a ceramic bowl and lay plate or cloth over the plastic wrap to keep the light out. 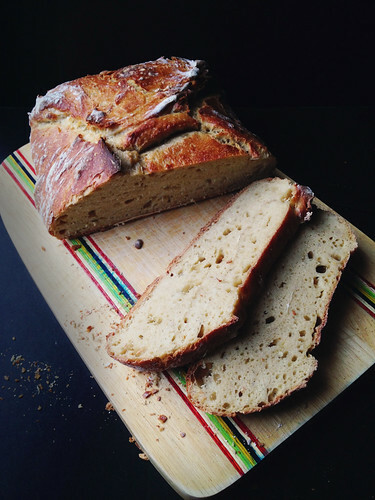 Einkorn flour contains a lot of carotenoids that oxidize when exposed to light and water. When the dough is ready, place a ceramic or cast iron dutch oven pot (at least 5 quarts) that is oven-safe and has a lid in the oven and heat for 30 minutes at 500°F then lower the temperature to 450°F. Turn out the dough on a heavily floured work surface. Pat the dough flat, and using a dough scraper or your hands, fold each of the four sides toward the center, using added flour to make a rounded shape. This is not like forming a typical loaf since the dough is quite soft. Don’t worry yourself too much about the shape because the dough will have a quick rise in the oven and will correct itself, leaving you with a beautifully rustic bread. Turn the dough right into the pot and baked cover for 30 minutes. Uncover and bake for 10-15 minutes more until the crust has darkened. Lift the loaf out of the dish and place on a cooling rack. Let cool for at least an hour before slicing. 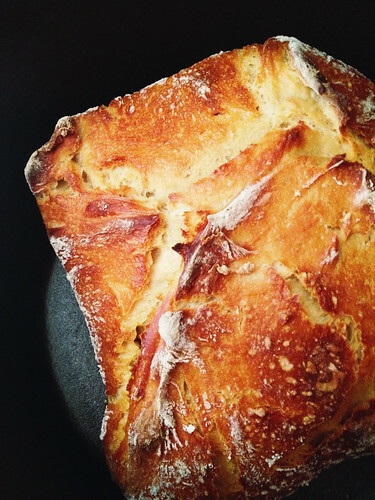 This entry was posted in food and tagged breads, einkorn, olive oil. Bookmark the permalink. Hi, I’m really glad you got a good result with my slightly modified recipe. I’d say it is worth acidifying the liquid even if you’re using 100% of Jovial’s white flour. I have also tried using lemon juice instead of apple cider vinegar, and that worked really nicely, too. I think using a blend of 50/50 white and whole grain Einkorn is my favorite variation so far, though. 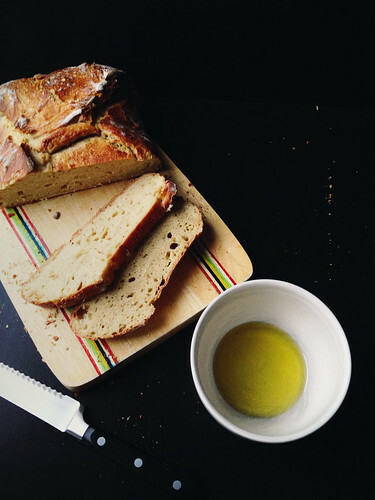 Olive oil is a great accompaniment to Einkorn bread, I am sure, but for me it has got to be butter! Thanks for all your suggestions and experimentations, Paul! They were most appreciated. I want to try the additions of spices next! Yeah, the ginger addition is nice just as a subtle hint from a half teaspoon. A full teaspoon would make it properly noticeable. Yesterday, as I was enjoying my 6th or 7th slice, I found myself thinking that some caraway seeds would make this into a really good Rye Bread substitute. Would probably make for a fine Patty Melt. This bread looks absolutely beautiful! I’ve tried baking this a few times and have never come close to the amazing color of your crust. I used fresh yeast versus dry active, but otherwise have followed the recipe to the letter. What am I missing?? Paul, I used active dry yeast, a bit of apple cider vinegar, and a cast iron dutch oven — only variations from the original recipe posted at Jovial. Other than that, I follow Jovial’s instructions to preheat the dutch oven at 500 for 30 mins before putting the dough in and baking at 450. Something that may have effect: when I made this batch, it was in Winter and admittedly my home was a bit cold — made dough proofing a bit of a challenge, enough so that I was proofing my dough under the warmth of blankets overnight and even then the rise wasn’t huge, so this batch’s dough may not have risen as much as most others would. Thank you for the recipe! 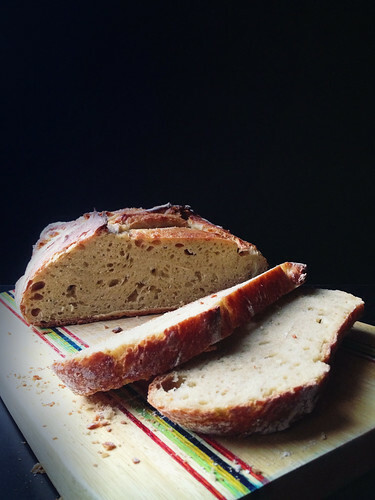 I experimented and baked with Einkorn extensively in 2012 and the first half of 2013; I am just returning to it now and wanted to make an attempt at a no knead bread. I’ve mixed up your recipe and will see how bakes off tomorrow. One discovery I made when mixing Einkorn doughs is to use a silicone spatula instead of my hands. It saves me so much frustration and much less of the precious dough is lost. I’ve also found that einkorn doughs with some fat added perform better for me, but I wanted to try your recipe exactly as is. Oh wow, it turned out beautiful and tastes amazing! Thanks for the recipe!